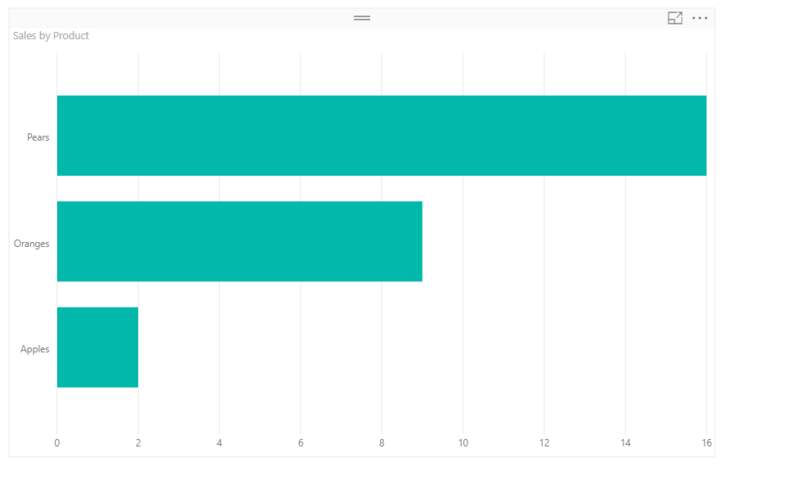 Many of my customers get the source data for their Power BI reports – usually Excel or csv files – sent to them as an email attachment on a regular basis. When they get one of these emails what usually happens next is that they save the attachment to a folder so Power BI can connect to it. This a tedious manual process and of course one that breaks down if they’re off sick or away on holiday. 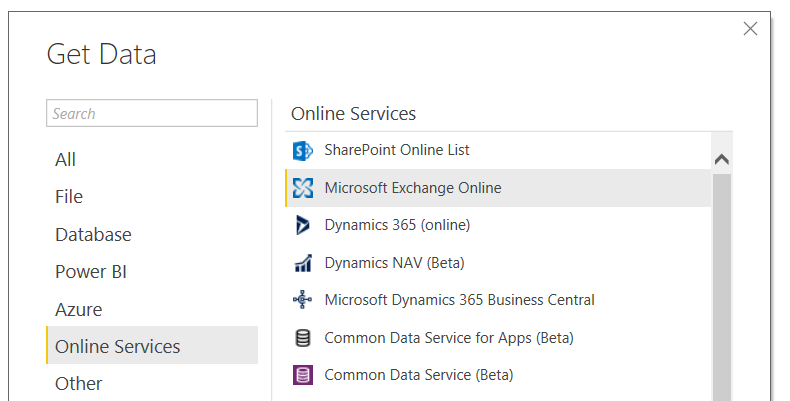 However if you are using Exchange or Exchange Online it is possible to eliminate this step and have Power BI connect directly to the attachment without downloading it. In this post I’ll show you how, using Exchange Online as an example. If you’re going to do this properly it will be better to create a folder in your mailbox, and add a rule to make sure that all the emails with the data you need go to that folder, but I’m going to keep things simple and assume that the emails I need are in my inbox. In my case after I selected the Microsoft Exchange Online data source all I needed to do was enter my email address in the Mailbox Address dialog box, and then in the authentication dialog select Microsoft Account and sign in, to get access to my data. Once you’ve done this, every time your report refresh it will use the data from the attachment in the most recently-received email and you have one less thing to remember to do every day. To be honest it’s a bit of a hack but it works so long as the emails you receive always come from the same sender, with the same subject, same attachment and so on. It’s a shame that Flow doesn’t have a “refresh Power BI dataset” action built-in (why doesn’t it??) because if it did, it would be very easy to refresh the dataset whenever an email with data was received. I know this is possible with Flow if you call the Power BI API but that involves a lot of technical skill to set up. Thinking about it, if you use Flow you could probably solve the problem in a completely different way by saving the email attachment to OneDrive every time an email arrived… but that needs a separate blog post. 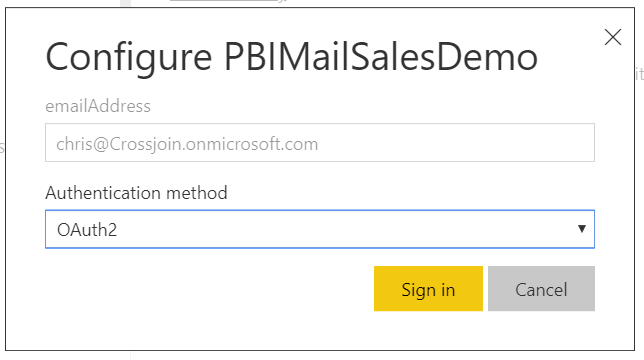 For some reason signed emails seem to appear in Outlook, but not in Power BI. Can someone confirm this? Thank you for your informative blogs. I feel, as you have mentioned in the last para, the easiest is to set up flow to save the attachments to a folder in OneDrive personal / OneDrive Business / SharePoint folder. And if the incoming files are of a monthly nature -meaning same excel file but with each months new data – then to a share point folder. Won’t this be the easiest to set-up? This is very cool. Another way to do this though is to use a Flow to automatically search for these emails and put the attachment in a specific folder. 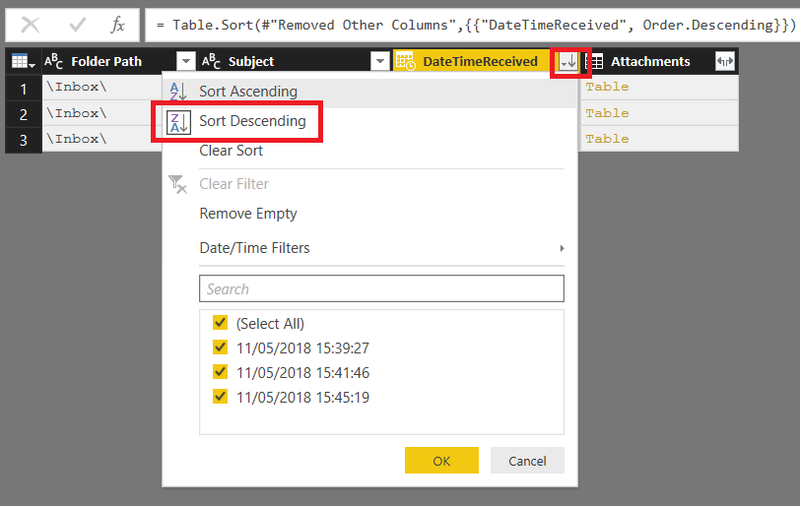 Then Power BI/Power Query only has to continually refresh for files in that folder. But the above is handy for those without Office 365 and Flow. Hi Chris, thanks for sharing this! I’ve experienced many cases like this where the source information flow is originated by mail, and I’ve managed most of them by creating shared folders on google drive or Sharepoint, where the updated / new files are deposited and then integrated into the Power BI Report through fetching the entire folder content. I wonder what is your experience and lessons learned in trying to change the culture in this manner, I’m sure you have many many interesting cases! Possibly. 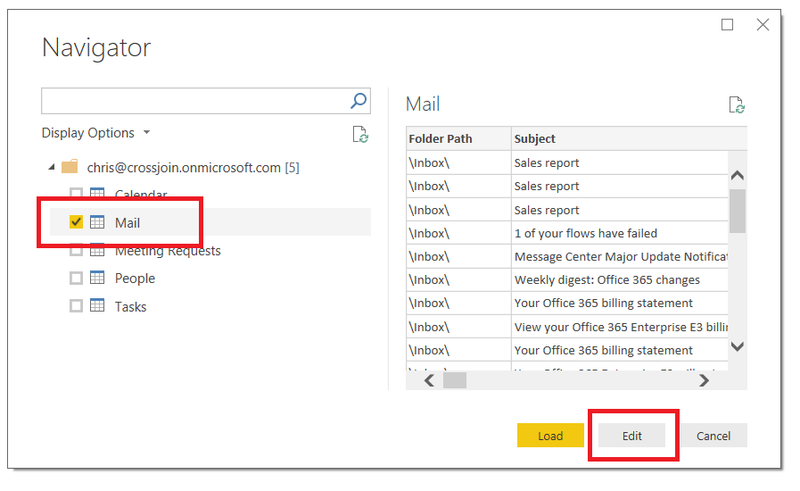 It looks like there is a REST API for both Outlook.com and Gmail, but you would need to do quite a lot of work to build a custom data connector to be able to use these APIs in Power BI. I went all the way to set up a Flow just to move files, but this is even simpler. Sleek and efficent soluton. Many thanks. Hi, i wonder if this solution will work if attachement name is changing every day (i have an excel export from system that has unique sequence of digits in the end of file name). could you help me? I have been using this method to put emailed alerts in to a format I can use to report on them. I have a question built a rule to send all the alerts to a specific folder. Then I pull all the email from that foldert and put them in to Power Query. its a lot of email growing every day so I wanted to moved the emails already loaded into different folder to speed up the refresh time. I am wondering If move the files will it remove the rows when I refresh the the connection? Unless you are using Premium and incremental refresh, yes, from the sound of things, if you move the files it will remove the rows. first of all thanks for sharing this solution. Unfortunately i’ve a problem when i want to refresh the information after a new mail was received. It claims to not be able to find a “key does not match a row in the table” (free tranclated from german). I guess the problem is this part of the transformation where the attachment is extracted (like a hash of something, which changes from mail to mail?). 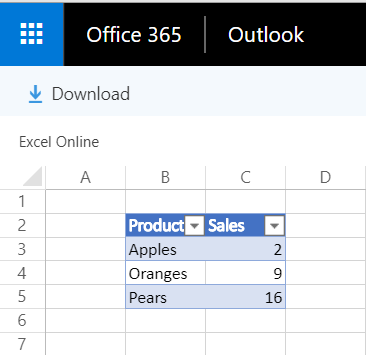 Is there a workaround to tell power bi to take “the first spreadsheet”file or what did i do wrong? I appreciate any help. Thanks in advance! The system producing the information is dynamically generating an attachment name I think because when the next days email comes into the mailbox I get an error. Thank you very much! This tutorial saved me tons of time and effort! Just a note that you must remove the column marked “Id” for some reason in order for this to work. Once I sorted that out, I was on easy street. Thanks very much for this tutorial. It saved me a ton of time. Just a note that you have to filter out the column marked “Id” for some reason. If you leave it in, refreshing the report throws an error. Once I sorted that out, I was on easy street. Thanks! This is a great walkthrough! I am having some trouble however getting it to read a third party scheduled attachment as an excel file. The email is always from the same sender, same subject, with an updated but consistent single attachment. The issue is that it is from a third party service and therefore is emailed in ‘protected view’ and the query editor gives me, “DataFormat.Error: External table is not in the expected format.” The only workaround I can find is manually open and save the excel file, but it no longer makes any sense to automate this if I have to manually open and save in order to refresh the data. Have you encountered this before? Is there any way for me to solve it automatically on my end? Thanks for the help!